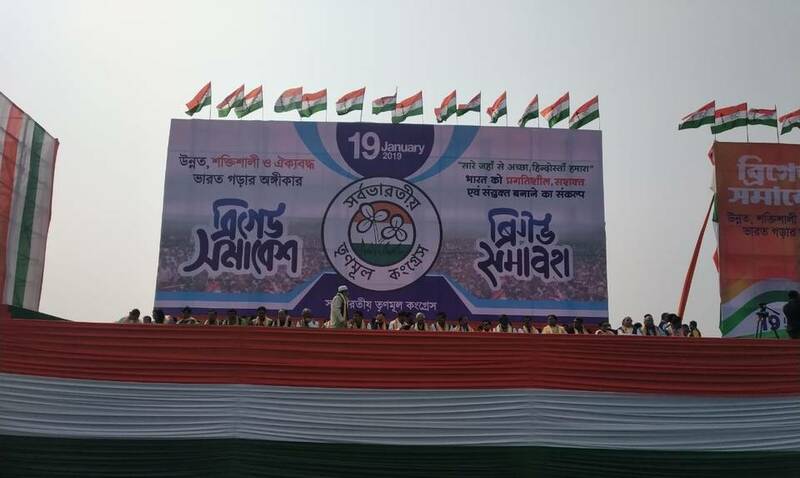 On Saturday, at least two dozen top national leaders are expected to participate in the Trinamool Congress-hosted rally at Kolkatas Brigade Parade Ground. Its part of West Bengal Chief Minister Mamata Banerjees efforts to bring the anti-BJP parties together on one platform. Several leaders, including INC president Rahul Gandhi, Janata Dal(S) leader H.D. Deve Gowda and Samajwadi Party chief Akhilesh Yadav have extended their support to Ms. Banerjee. All roads leading to Brigade Parade Ground in Central Kolkata are blocked as Trinamool party cadres are either marching towards the venue or traveling in open lorries or buses. The above photograph is near Bijan Setu in Ballygunje. As many as 10,000 security personnel will be deployed in and around the venue of the rally and around 400 police pickets have been set up to ensure foolproof security, the police said. Lakhs of TMC supporters and workers have started arriving in the city from all over the State. Besides the huge stages, 20 watchtowers have been erected and 1,000 microphones and 30 LED screens put up for the crowd. Janata Dal(S) leader H.D. Deve Gowda, Samajwadi Party chief Akhilesh Yadav, Nationalist Congress Party chief Sharad Pawar and former Arunachal Pradesh Chief Minister Gegong Apang, who quit the BJP a few days ago, arrived in Kolkata by Friday evening. Congress leaders, including Mallikarjun Kharge, are expected early on Saturday. The city is covered with Trinamools flags and billboards featuring Ms. Banerjee and her nephew Abhisekh Banerjee, MP. The city is full of hoardings featuring three Chief Ministers, one former Prime Minister (Mr. Gowda) and leaders representing the entire anti-BJP spectrum. There will be so many leaders that it would be difficult to allot more than 10 minutes to each of them, said a close aide of Ms. Banerjee. Trinamool activists have arrived from all over West Bengal and are housed in various stadiums; food is distributed at various points in the city.